The timing has been atrocious. I’m struggling to move into a bi-vocational approach to church planting. I’m working insane hours trying to keep the plates spinning and have seen a few come crashing down lately. In the midst of this circus I’m reading a whole list of books and writing a somewhat lengthy paper for SMU. Typically, I like to set regular time aside to process through books of this nature – especially a long list that work together somehow. Time to read and process is a bit of a luxury these days. Even though it has been hard to keep up with the self-inflicted pace, the books have been phenomenal. I’ve posted a few excerpts from my paper and introduced a few of these books. This weekend I’m trying to finish sections 5 and 6 so that I can work on 7 and 8 next week. Here is the introduction to the section covering a short, but incredibly helpful book by my professor, Elaine Heath. If anyone has read this (or any of the others I’ve referenced) please share your thoughts as well. 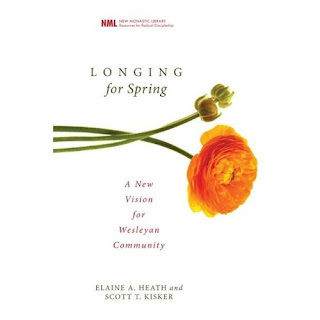 Longing For Spring: A New Vision for Wesleyan Community by Elaine Heath and Scott Kisker. Though addressed largely to a Wesleyan audience, Heath and Kisker have issued a call to the church at large with this short book. Perhaps what is most striking is the clear conviction that something new is possible, even within reach, for established churches. The formation of new monastic communities does not have to be seen as competition or rebellion, it can be embraced as a faithful and powerful ministry of the church, with deep roots in our various traditions. If the book, New Monasticism, (written about here) addressed the question of what the new monastic movement has to say to the church, then this book begins to describe ways in which that conversation can bear fruit in the church. The desire for authentic community and the call to live out whole-life discipleship beyond membership in an organization are in no way new impulses in Christianity. As others have done before, Longing for Spring explores some of the different expressions that have arisen throughout our history, from the Benedictines and Beguines to Pietists and notably, the early Methodists. Herein lies a subject often apparently overlooked in both monastic and missional literature. The semi-monastic structure of bands and class meetings in early Methodism contained several components that are essential to the cultivation of authentic community. The “bands” were small, gender and life-situation specific groups that met together regularly for prayer and confession. The Wesley brothers developed this discipleship tool from what they encountered among the Moravians in America. The mutual accountability and humility fostered by these bands were reminiscent of the more intentional monastic communities previously mentioned. The class meetings were even more central to the formation of Methodist community. Though attendance had decreased since the mid-19th century, until 1939 participation in these meetings officially defined membership the society. Because the classes were lay led, the beginning of localized clergy in Methodism marked the gradual ending the class meetings’ significance. The relatively short span of monastic influence in Methodism may be to blame for its relative obscurity outside Methodist circles. However, the demise of the class meetings may well have something of great value to teach us all regarding monastic and missional community. I find no reason to suspect that anyone within the denominational hierarchy sought to discourage the monastic impulses in Methodism by moving away from a truly itinerant preacher system. However, Kisker notes that with the arrival of localized clergy, people could go straight to him with their questions, and the lay led class system slowly (depending on perspective) lost its efficacy. Would the effect have been different had the localized preacher been called from the congregation rather than placed from the outside through a still somewhat itinerant system? Whether a different process would have still affected class participation can be debated. It seems less debatable that, in the given case, there is a clear connection between the presence of ordained clergy and a decrease in the “regular” disciples’ participation in monastic commitments. Stated another way, the localization of clergy appears in this case to be correlated with an increase in a more passive consumer approach to religion. I do not think there is enough evidence here to suggest that having ordained or trained ministers located in a community will universally lead to lower levels of whole-life discipleship. However, Kisker’s brief historical sketch does clearly suggest that we should think carefully about the impact our models of leader selection and preparation may have on future generations of disciples, particularly if we desire to see an increase in missional and monastic characteristics. Posted on April 10, 2010, in church planting, community, elaine heath, new monasticism, smu, wesleyan community. Bookmark the permalink. Leave a comment.